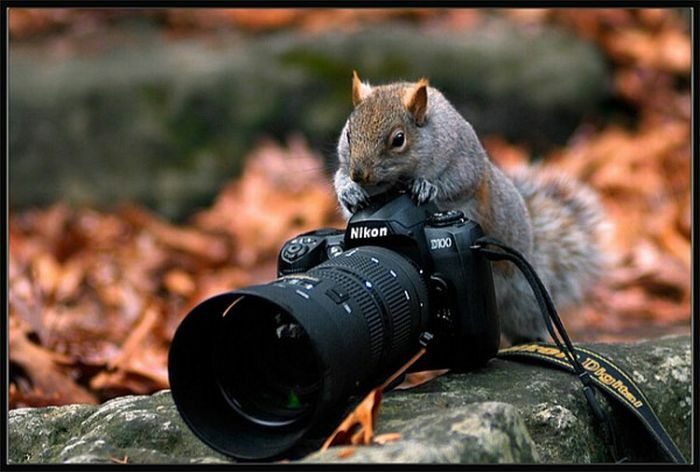 This is a squirrel with a camera. This is a ridiculous picture, much like the topic of today's photo fun picture. What in the name of Elmo is going on with Peyton Hillis? I took this pic of Hillis turning training camp. Peyton Hillis came to Cleveland from a trade with the Broncos. In Denver, he was underutilized and was, if you will pardon the expression, a nobody. Hillis arrives in Cleveland and had an amazing breakout season. His "aw shucks thank ya ma'am" attitude resonated with Browns fans. Maybe we were just over the fiasco known as LeFoolio, but Hillis quickly became a fan favorite. Stories started circulating about his workout ritual of strapping himself to a pick up truck and pulling it through his Arkansas neighborhood. Through fan votes, he was selected as the Madden cover boy. According to espn, it took a total of more than 12,000,000 votes throughout the competition to get him that honor. 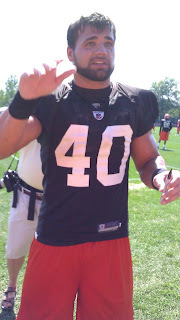 At training camp, Hillis was quickly mobbed by the fans. In the pic I took, he was pleading with the fans to not push and shove and he would sign as many things as he could (like my football). There was a feeling of the Browns being a contender. Maybe not Superbowl champions, but at least we were going to have a decent season. Then, Hillis got strep throat. On the advice of his agent, he sat out. Fans everywhere cringed. Rumors started to surface...was he sick or faking it as a contract ploy. I personally think he was sick. I also think Hillis is less than Media savvy. It was at that point that the crazy train jumped the tracks. Was he hurt or wasn't he? Were the Browns benching him to teach him a lesson (see more here)? Allegedly he went to Arkansas to marry his snuggle bunny when his team mates thought he should be rehabbing his strained hamstring. Then the blow up of all blowups...he was rumored to have blown off trick or treating with kids in Slavic Village. 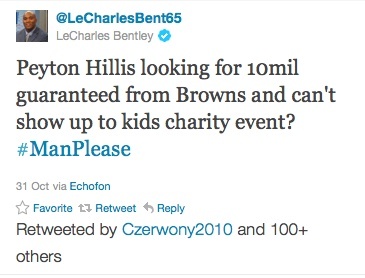 LeCharles Bentley of for Browns fame and a local radio host announced on his show and via twitter that Hillis dogged out a bunch of kids...uncool. Over 100 people shared his tweet on their page to all of their friends. Then hundreds more after that. With nothing else going on in Cleveland sports, the Tribe off-season and no NBA season, sports talk radio was all over this like sprinkles on a doughnut. 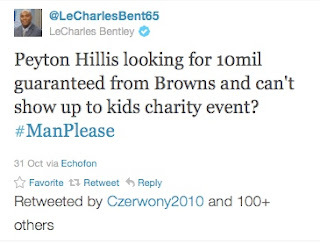 Later, after much of the day was spent vilifying Hillis, it turns out he was never confirmed for the event, and it was not even the charity's event but it was Bentley's. At that point, the damage was complete. Hillis went from the penthouse to the outhouse. More rumors are swirling about the effect the drama is having on the team as a whole. People are rallying around him for a new contract...there are no "pay the man" t-shirts proudly worn as they were with Josh Cribbs. If the game were at home, would fans set his jersey on fire they way they did with Braylon Edwards? I'm certainly not calling for that. I just want the man to play football. I want him to play football and not be a part of the Cleveland sports fail reel. Edwards jersey on fire in the munilot.